When we first decided to produce a "Best of AB In 2016" we underestimated what a big job it would prove to be. We had to cull about 75% of the editorial produced in the year 2016, no mean task when it involved a total of 1300 pages to begin with, pulled back to a more rational 350 pages for the new book – and even that was a struggle. We were determined to choose articles and columns that first and foremost reflected significant features of the year or made important statements of a more permanent kind. Crudely put, we were after the "good stuff" from 2016. Of interest, there is no central theme, or editorial pathway. 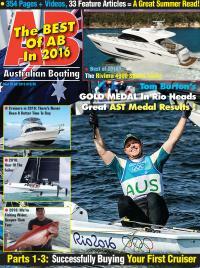 Like Australian Boating itself, the “Best Of AB 2016” is an eclectic editorial mix that covers a wide range of subjects, in both power and sail, with an interesting group of technical features, boat reports, retro tests and several strong Consumer Reports, including the acclaimed 3-Part Series "Buying A Production Cruiser”. Description: 354 page PDF production of 36.1 mb in book form measuring 275mm High x 205mm wide (std American quarto).